Don’t you love candied citrus? I know I do. Citrus and summer go together like peanut butter and chocolate so there is no better time to make these bright, sweet and tart little candies. Don’t be intimidated by the concept of candying. There are NO candy thermometers or cooked sugar here. This recipe could not be easier! 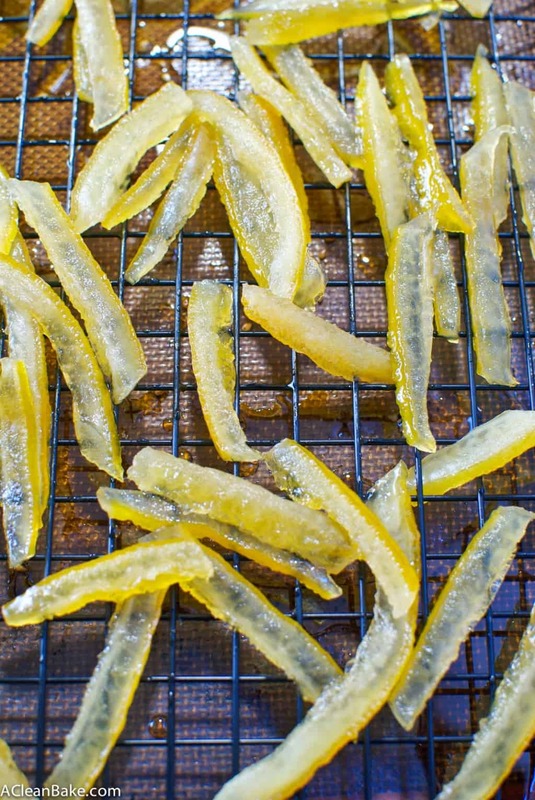 It starts with cleaned and sliced lemon peel. If you don’t like lemon, you can easily substitute orange or grapefruit peel. Make sure you have removed all of the lemon (or orange or grapefruit) meat from the inside of the peel, then quickly boil the peels in plain water until tender before a long boil in sugared or honeyed water. The peel dries for a long time before it is ready to eat (and, optionally, coat with sugar, and optionally still, dunk in a layer of chocolate, both of which steps that I skipped), so while this recipe is a bit time-consuming, it’s insanely hands off. And, like I said, no candy thermometer required! As though a big pan full of candied lemon peels isn’t enough, you get a bonus batch of lemon simple syrup out of the deal too. Simple syrup is nothing more than sugar (or honey) dissolved in water and reduced. It is an absolutely fantastic addition to summer cocktails, alcoholic or non. One of the best drinks I have had recently was a cherry spritzer made from combining sour cherry juice and this simple syrup with sparkling water. It’s so refreshing, especially garnished with one of these chewy, zingy candied lemon peels! 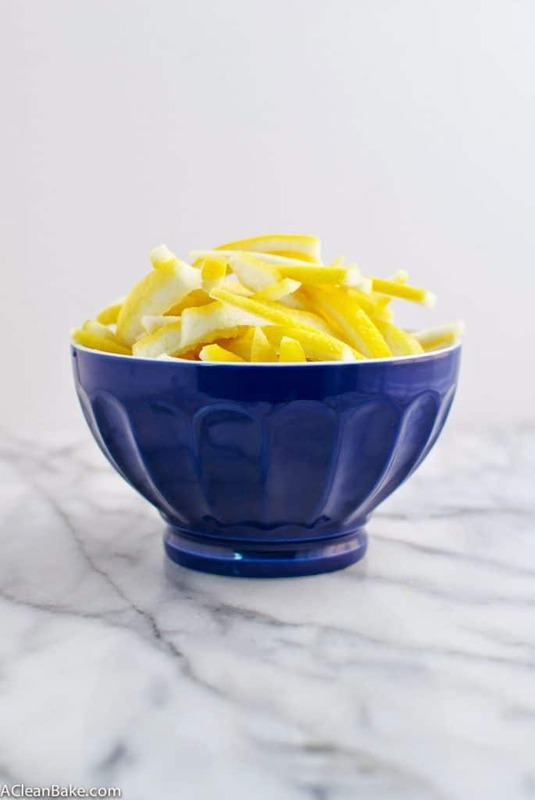 In a stockpot that fits the prepared peels with room to spare, cover the peels with tap water and bring to a boil. Boil for 3-5 minutes before draining. Return the peels to the pot and repeat. After the second boil, put the cooked peels in a bowl and set aside. Put the sugar or honey (or both) plus an additional 2 cups of water into the pot, stir briefly, and bring to a boil. Stir to dissolve the sugar/honey into the water, then add lemon peels. Bring the pot back to a low boil and cook for 1 hour until the water is thick and has reduced to below the level of the lemon peels and the peels are translucent. Turn off the heat and let the peels cool completely in the pot with the liquid, with the top off. Once the peels and cooking liquid have cooled completely, strain the peels, reserving the liquid in a separate container. Place a cooling rack over a cookie sheet or cutting board covered with wax paper or a nonstick pad. 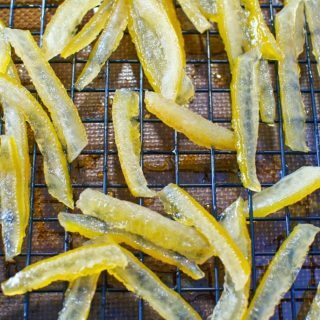 Spread the peels evenly across the rack and set aside in a cool, dry place to cool completely for about 24 hours, or dry for about 3 hours before pressing gently into a bowl of granulated sugar to coat. Once the peels are completely dry, or have been thoroughly coated with sugar, dunk halfway in melted chocolate and place back on the drying rack until the chocolate solidifies (optional). Store peels and simple syrup separately in airtight containers at room temperature for up to a week, or in the freezer for up to 6 months. Yield: About 3 cups lemon peels and 1 cup (give or take) simple syrup. If you use honey, it is normal that your peels will not ever completely "dry". I dried mine for 24 hours, and they remain moist and sticky in spite of it. Don't get me wrong; they're delicious, but you will be more likely to need a napkin after eating them! i just finished making your Lemon Peels and your Lemon Bars. Excellent. Will keep the recipes! I’m so glad these recipes were a success for you, Sue! Hope you’re having a great weekend! Never thought of this! Love it! Been searching for a sugar free option…would Stevia work as a sugar replacement? Probably not. You need something that will crystallize onto the lemon peels. I’m sorry! Your burner may run hotter than average. If it’s that active (foaming, burning), it’s best to turn down the heat to achieve a less active boil.